As a parent, what stands out to me in the story of the Transfiguration is something very simple: the attitude of the disciples. Jesus took with him Peter and John and James, and went up on the mountain to pray. And while he was praying, the appearance of his face changed, and his clothes became dazzling white. Suddenly they saw two men, Moses and Elijah, talking to him. They appeared in glory and were speaking of his departure, which he was about to accomplish at Jerusalem. Now Peter and his companions were weighed down with sleep; but since they had stayed awake, they saw his glory and the two men who stood with him. Just as they were leaving him, Peter said to Jesus, ‘Master, it is good for us to be here; let us make three dwellings, one for you, one for Moses, and one for Elijah’—not knowing what he said. While he was saying this, a cloud came and overshadowed them; and they were terrified as they entered the cloud. Then from the cloud came a voice that said, ‘This is my Son, my Chosen; listen to him!’ When the voice had spoken, Jesus was found alone. And they kept silent and in those days told no one any of the things they had seen. At first, Peter and his companions aren’t paying close attention: they are too tired. But because they stay awake, they see something amazing. And as soon as they do, they want to stay in the moment forever. I will leave intelligent reflection on the meaning of the transfiguration to other commentators, and simply say one thing: Peter and the other disciples, witnessing this great event, are just like me as I watch the far more mundane work of God: the growth of ordinary human beings. At first, I was so tired! All I wanted was to sleep in those early weeks and months and years. Sleep was a rare and precious thing. Young people cried out for me at all hours of the day and night. It did not matter what wondrous thing might be occurring: the need for rest weighed on me viscerally. And then, as time went on, I gradually realized what was happening: I was watching God create a completely unique, fully grown human out of thin air, out of a moment of passion, out of a newborn babe. Adults were growing, slowly but surely, in my house every single day. Then, all I wanted was to slow the whole thing down. To stop it, if it all possible. “It is good for us to be here!” I could say: at age five, or age ten, or even age fifteen. But staying in one place or time was never possible. My oldest starts high school in a few weeks; my youngest begins middle school. I see now that the empty nest arrives. And all I can do is listen to the one God called “Beloved Son” and trust that through this process of tending and letting go, I am growing more and more into the likeness of the One who made me and my children both. And I can watch for the shining of God’s glory in each day. 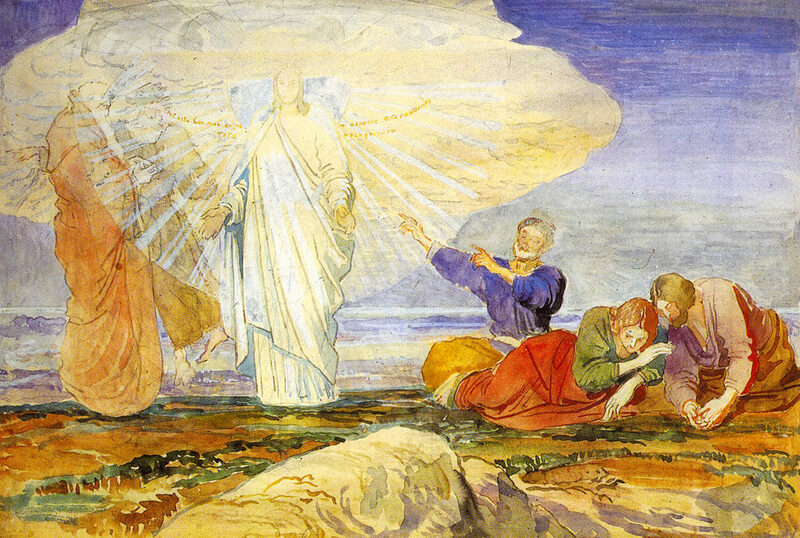 Does your church observe the feast of the Transfiguration? How about you?